CAMI is offering a fully integrated AAL solution by providing services for health management, home management and well-being (including socialisation, and reduced mobility support). CAMI builds an artificial intelligence ecosystem, which allows seamless integration of any number of ambient and wearable sensors with a mobilerobotic platform endowed with multimodal interaction (touch, voice), including a telepresence robot. The services offered by CAMI ecosystem address both healthy individuals as well as those with age related impairments. CAMI solution will reconcile the increased demand for care in the current ageing society with limited resources by supporting an efficient and sustainable care system. This will allow older adults to self-manage their daily life and prolong their involvement in the society while allowing their informal caregivers to continue working whilst caring for their loved ones. The end-users from Denmark, Romania and Poland will be involved throughout all the phases of the project. (3) visible demonstrations of the CAMI system through extensively tested and validated pilot. 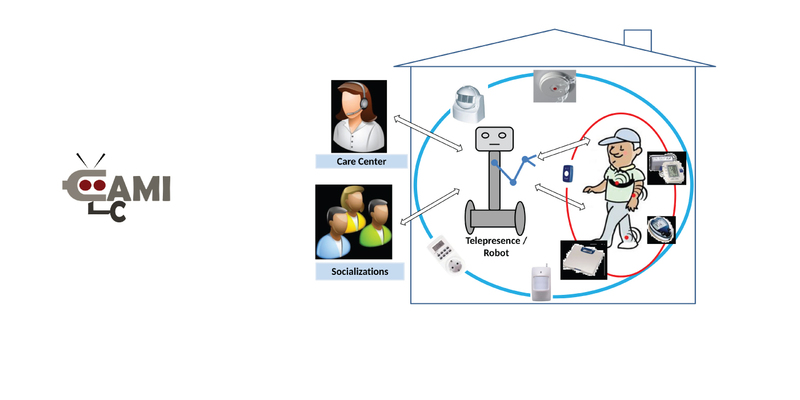 (4) telepresence for communication (video, voice) with caregivers, family, friends through multi-modal interfaces.